At their most recent cross-country meet, the Western Invitational, Josh McGillivray led the team to a second-overall finish, placing third individually. McGillivray, who led the field for McMaster for the first time in his career, said he treated this race differently than his past competitions, going in with a mindset to start at the front of the pack and staying there. Clearly it worked as he had a career day, enough to get him named Pita Pit Athlete of the Week. He finished the 8 km course in an astonishing 24:20, and McGillivray thinks he will keep this week’s new strategy going forward to see if it will continue to work, but he will not change everything in his race-day preparations. Cross-country is more of a mental sport than most people would realize, far more than most would consider it to be at first glance. There are so many people you are directly competing with that it can certainly take a toll mentally on a runner, constantly checking what place you are in, al the while to continuing to push yourself. McGillivray highlighted the fact that with lengthy races, you are constantly pushing yourself to keep running as hard as you can, and this is where a lot of strength and grit comes in. The third-year runner also noted that preparation for cross-country meets is always very thorough. He said that making sure to get a good sleep, not only the night before but two nights before, can be instrumental to his success in addition to eating properly. Even though you run individually, McGillivray emphasized that cross-country really is a team sport. Although you run by yourself during the races the sense of community really prevails, and that traditional sense of team chemistry is still very present. For example, several Mac runners who were not even participating in the track meet because they had already run in a previous race came to cheer on their teammates who were competing. McGillivray said this is one of the tightest groups of guys he can remember, which allows them to be their best selves athletically as they continue to push each other. McGillivray highlighted the importance of staying cool and not overworking oneself, something he credits his coach, Paula Schnurr, for being very good at. He also stressed the importance that even though it can be really easy to go too hard, cross-country nationals is still a month and a half a way so it’s important for the athletes to pace themselves throughout the season. “I think that the depth of this team, although we have had really deep teams the past few years, we’ve come fourth consecutively in the past five years now at nationals, but this year and the depth of this team is pretty insane,” McGillivray explained. McGillivray believes that this could be the year the team breaks recent tradition and places on the podium at nationals. “On any given day, because you have your top five scorers and then your top seven are considered your team because you have two alternates, I don’t think we’ll have the same top seven in a consecutive race all season,” McGillivray said. While there is still a long time before the team transitions to the indoor track season, the start to this year looks promising. 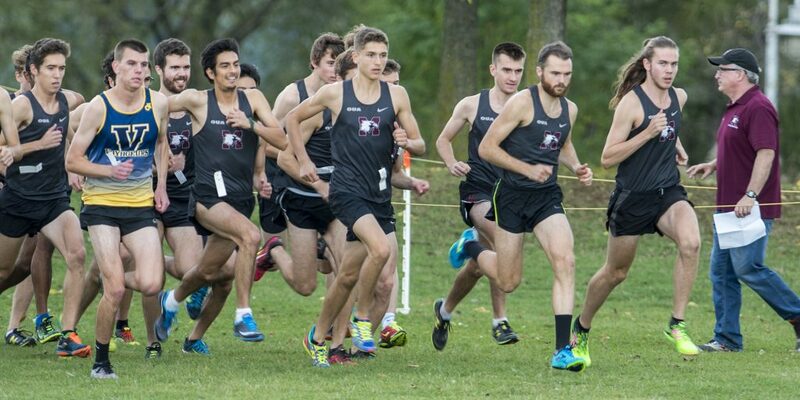 With a roster that looks better than ever, a very clear drive and determination to succeed, the men’s cross-country team has nationals in sight and look poised to buck the trend of placing fourth for the past five years.